My number one gift on my Christmas wish list this year was a food processor...a good one. I wanted one with making nut butters specifically in mind because almond butter can be a real pain to make. My old processor was doing just fine...until it starting spewing gold dust from the bottom and stopped working. Anyways, this is the beautiful machine Santa brought me! I've been buying my nut butters from Nuts to You Nut Butter since my old processor died, but I am not really happy with store bought almond butter, since I am never sure if the almonds are truly raw, and I like to soak my nuts before I eat them. 2. Put a manageable amount in a food processor and press "on"
That's really all there is to it. The process is not the difficult part...it's the TIME! Making almond butter takes forever, especially when using soaked and dehydrated almonds. I suspect the soaking process must leach some of the natural oils out of the almonds. I base this hypothesis on being able to see oil-y spots in the water as I drain the nuts. And eventually you'll get something spreadable and delicious! 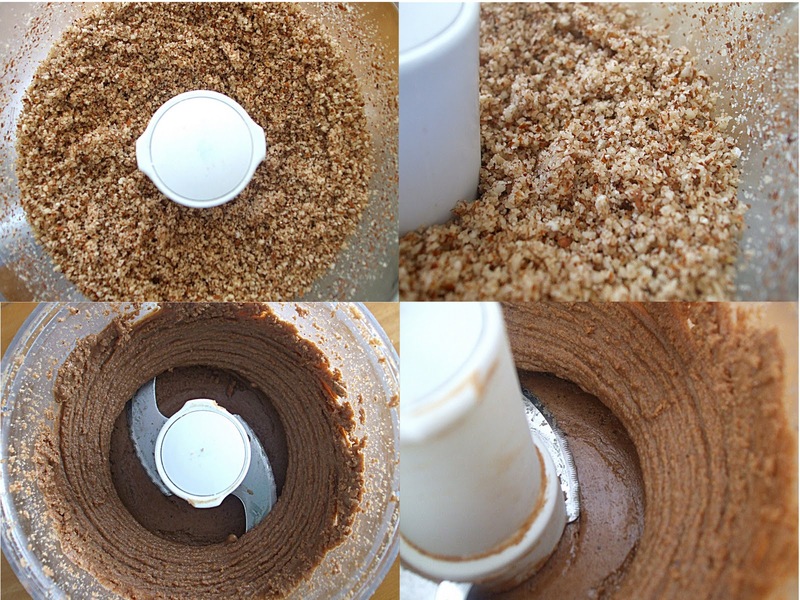 Keep going as long as your patience can last...the longer you food process, the smoother your almond butter will be. I cannot tell you how much of a pleasure it is to make peanut butter compared to almond butter. In my new food processor, I didn't even need to scrape down the sides! 1. Obviously, if you don't care about raw foodism, you can use roasted almond or unsoaked raw almonds. I have read that using roasted almonds makes for a much quicker process, something about the oils being released with the heat. 2. You can add salt or make crunchy nut butter by adding more nuts towards the end of the process. 3. You can sweeten and flavour it with ingredients like honey, maple syrup or vanilla. 4. You can make your life a lot easier by adding oil, either a very neutral oil or almond/peanut oil. I might start adding almond oil, given my suspicions about the leaching from the soaking and dehydrating process, but in general I like to avoid adding anything...since that's the whole reason I make it myself. Food Photography is looking really good!! I was going to say the same thing! Good job!